W-sitting is when a child sits on their bottom with their knees bent and feet positioned outside of their hips. If you’re standing above your child, you will see their legs and body make the shape of a W.
Often children move in and out of a W-sitting position while they’re playing. It is okay for a child to move into a W-position sometimes, as long as children don’t remain seated like this for very long or use it as their regular sitting position. There are risks with W-sitting for long periods of time or W-sitting so often that it’s a child’s go-to sitting position. What risks are associated with W-Sitting? Hip dislocation: If a child has hip problems, sitting in the W-position can put strain on the hips and joints and increase the likelihood of dislocation. Limited trunk/core strength: The wide sitting stance of the W-position makes it easier to keep the body upright. Children sitting in a W-position don’t have to use their core muscles as much and won’t develop them as they would in other sitting positions. 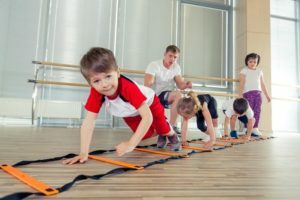 Lack of cross body movements: The W-position makes it difficult for children to rotate their upper bodies and reach across to either side with one or both arms. No hand preference: In a W-sitting position, a child has too much trunk control and stability. It’s very easy to use either hand to accomplish tasks. However, developing hand preference is important for writing ability later on. Increased muscle tightness: If a child is prone to muscle tightness or Hypertonia, then sitting in a W-position will increase tightness in hips, knees, and ankles. What can you do about your child’s W-Sitting? If your toddler enjoys W-sitting, there are steps you can take to break their W-sitting habit. If you notice your child frequently sitting in a W-position, take steps to correct the behavior. Remind your child to “fix their legs” whenever you see them sit in a W-position. Offer your child a small chair or stool as an alternative to sitting on the floor. Legs crossed: Child sits on their bottom, crosses their legs, bends their knees and tucks their feet underneath. Sometimes referred to as criss-cross applesauce. Legs in front: Child sits on their bottom with their legs straight in front of them. Legs to the side: Child sits on their bottom and bends their knees so both legs are lying in one direction on one side of their body. Issues with muscle tone are quite common in children. Learn the signs and symptoms of Hypertonia and Hypotonia.